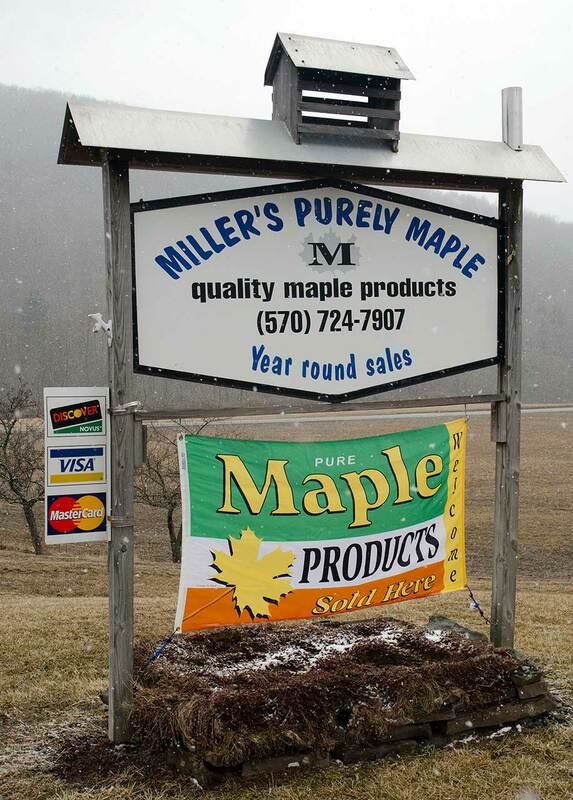 At Miller’s Purely Maple, located about five miles north of US-6 between Mansfield and Wellsboro in scenic Tioga County, the highest-quality maple products are produced by Dale and Melanie Miller. Dale and his brother started tapping trees and boiling syrup to give to his family and friends as a hobby in the 1970’s, but got out of the business for a few years. Then, he married Melanie, whose family produced maple on their farms, and once again sparked Dale’s interest in sugaring. In 1995, they decided to begin again in earnest, tapping 100 trees and making forty gallons of syrup in that first year alone. A local farmer readying to retire sold his equipment to the Millers that fall, and the following spring, Dale and Melanie produced 180 gallons from 600 taps on the Miller Farm, with plans to expand in following seasons. Dale and Melanie’s sons, Joel and Justin, helped on the farm throughout their growing years, but have now gone off to college, and it is unclear whether they will want to continue in the maple industry. “I call myself a first and last generation producer,” Dale said with a grin; though the business will always be here should one of the boys change his mind. Dale and Melanie love producing syrup, and that is good enough for them. Dale and Melanie have created quite a business, averaging 1000 gallons of syrup produced on the farm each season, reaching a goal set for themselves in the early days of their business. Though the Millers still fire with wood, their entire operation is on a tubing system, with underground pipelines to carry the sticky, sweet sap to the sugar house. “Every tree we tap is on property we own,” Dale said. They currently maintain 5,000 taps on the sprawling 570-acre farm. Some 460-acres of this land comprised the farm purchased by his father in the 1940’s, added to Dale and Melanie’s holdings after his father’s passing. That time is, in turn, invested into the business of making delicious maple products on the Miller Farm. The retail shop, open year-round, stocks syrup, cream, sugar, candy and maple-coated nuts and a variety of seasonal maple goodies for sampling. The Millers use only food-grade plastic and stainless steel equipment to create prize-winning, preservative-free maple syrup. A video detailing the Millers’ operation is available that tells about the history and production processes at the farm, and contains general information about pure maple syrup. Melanie also designs labels for her syrup bottles which highlight area attractions such as the Pennsylvania Grand Canyon, Hills Creek State Park and other scenic views and cultural events. To reach the Miller Farm, take PA-287 North from US-6 in Wellsboro. Near the village of Holliday, turn right onto Hills Creek Road. 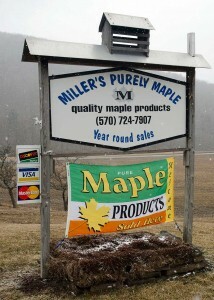 Drive 2.5 miles and then turn left onto Hills Creek Lake Road, where Miller’s Purely Maple is the first property. In early 2103 Dale retired from the United Parcel Service after 33 years of service as a delivery driver. Dale has used his extra time to improve the maple operation. He now seeks to improve and upgrade the current operation by doing things such replacing the tubing in the woods. The Miller family now seeks to create a more efficient operation and spend more time promoting and selling the maple products that they produce. What does the future hold? There are currently no plans to expand the operation by simply tapping more trees. The focus will be more on managing the current operation to the highest degree of efficiency and increasing production in this manner in the future. Using this strategy moving forward, the Miller family now looks to produce 1,500 gallons or more in the coming seasons. For more information call 570-724-7907 or email us at contact@millersmaple.com.